ADI has released a video exposing the inherent suffering of lions and tigers in a travelling show. The controversial act, ‘An Evening with Lions and Tigers’, is the last in the UK to feature big cats – an outdated practice that is overwhelmingly opposed by the public, has been barred by many local authorities, and the government has promised to ban. ADI filmed 29.5 hours of footage, recorded at the big cats’ accommodation in the Black country over a three day period between 7th and 9th September 2016. The footage shows the animals displaying abnormal behaviour, demonstrating that they are not coping with their environment. The site where the lions and tigers are kept is situated next to a horse abattoir and sandwiched between two busy main roads, the M6 Toll road and the A5, with incessant rumbling of traffic. Chipperfield has since joined Italian circus ‘Circo Di Vienna’, leaving his animals behind, for a four month winter season, working with a tiger act. He intends to return to the UK with a new show in 2017. The lions and tigers live in a cage on wheels. One day, the lions were not allowed out at all. Another day, the tigers were given just 90 minutes access to the enclosure. 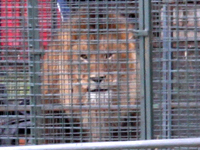 Inside the cages, the lions and tigers are seen to pace back and forth continuously to relieve their stress and boredom. Such pacing is an abnormal, repetitive ‘stereotypic’ behaviour, not seen in the wild, but commonly observed in circuses, and indicates compromised welfare. The lions, Tsavo and Assegai, and tigers, Nadi, Syas and Altai, are shut behind heavy steel shutters at night. ADI witnessed the animals entombed like this for up to 14 hours. During our three days of observations, two dogs were kept inside the circus training ring and were not let out. 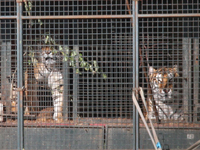 Even when the animals are given access to the muddy, waterlogged exercise enclosure, the tigers will often remain inside their cages, appearing institutionalised to the extent that they are reluctant to leave their familiar space. Despite assurances from the circus industry that animals are well cared for, the physical and psychological health of animals in circuses is inevitably compromised. Animals in circuses can also be subjected to brutal training methods and violence – wherever ADI has conducted an undercover investigation in the UK and around the world, it has documented acts of abuse. Take action for circus animals! Avoid circuses that have animal acts, and encourage your friends, family, and colleagues to do the same. Speak out when an animal circus comes to town – email us for leaflets and posters. Ask your MP to urge the Government to bring in its promised ban, and call for measures to protect domestic species too. In Wales contact your AM, in Scotland your MSP, Northern Ireland your MLA, and in the Republic of Ireland your TD, urging them to call for action too. Donate today and help ADI campaign for an end to the suffering of animals in circuses.